The Viceroyalty of New Granada (Spanish: Virreinato de Nueva Granada [birei̯ˈnato ðe ˈnweβa ɣɾaˈnaða]) was the name given on 27 May 1717, to the jurisdiction of the Spanish Empire in northern South America, corresponding to modern Colombia, Ecuador, Panama, and Venezuela. The territory corresponding to Panama was incorporated later in 1739, and the provinces of Venezuela were separated from the Viceroyalty and assigned to the Captaincy General of Venezuela in 1777. In addition to these core areas, the territory of the Viceroyalty of New Granada included Guyana, southwestern Suriname, parts of northwestern Brazil, and northern Peru. Nearly two centuries after the establishment of the New Kingdom of Granada in the 16th century, whose governor was dependent upon the Viceroy of Peru at Lima, and an audiencia at Santa Fé de Bogotá (today capital of the republic of Colombia), the slowness of communications between the two capitals led to the creation of an independent Viceroyalty of New Granada in 1717 (and its reestablishment in 1739 after a short interruption). Other provinces corresponding to modern Ecuador, the eastern and southern parts of today's Venezuela, and Panama came together in a political unit under the jurisdiction of Bogotá, confirming that city as one of the principal administrative centers of the Spanish possessions in the New World, along with Lima and Mexico City. Sporadic attempts at reform were directed at increasing efficiency and centralizing authority, but control from Spain was never very effective. The rough and diverse geography of northern South America and the limited range of proper roads made travel and communications within the viceroyalty difficult. The establishment of an autonomous Captaincy General in Caracas in 1777 and the preservation of the older Audiencia of Quito, nominally subject to the Viceroy but for most purposes independent, was a response to the necessities of effectively governing the peripheral regions. Some analysts also consider that these measures reflected a degree of local traditions that eventually contributed to the differing political and national differences among these territories once they became independent in the nineteenth century and which the unifying efforts of Simón Bolívar could not overcome. This success was soon known in other Guajiro areas, and more men joined the revolt. According to Messía, at the peak there were 20,000 Wayuus under arms. Many had firearms acquired from English and Dutch smugglers, sometimes even from the Spanish. This enabled the rebels to take nearly all the settlements of the region, which they burned. According to the authorities, more than 100 Spaniards were killed and many others taken prisoner. Many cattle were also taken by the rebels. The Spaniards took refuge in Riohacha and sent urgent messages to Maracaibo, Valledupar, Santa Marta and Cartagena, the latter responding by sending 100 troops. The rebels themselves were not unified. Sierra's relatives among the Indians took up arms against the rebels to avenge his death. A battle between the two groups of Wayuus was fought at La Soledad. That and the arrival of the Spanish reinforcements caused the rebellion to fade away, but not before the Guajiro had regained much territory. The territories of the viceroyalty gained full de facto independence from Spain between 1819 and 1822 after a series of military and political struggles, uniting in a republic now known as Gran Colombia. 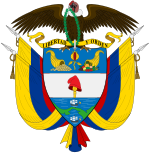 With the dissolution of Gran Colombia, the states of Ecuador, Venezuela, and the Republic of New Granada were created. The Republic of New Granada, with its capital at Bogotá, lasted from 1831 to 1856. The name "Colombia" reappeared in the "United States of Colombia"; the new name for the country having been introduced by a liberal government after a civil war. The use of the term "New Granada" survived in conservative circles, such as among ecclesiastics. ^ "El archipiélago de Los Monjes y las relaciones diplomáticas con Venezuela: Historia de una cesión territorial cuyas consecuencias siguen vigentes - banrepcultural.org". banrep.gov.co. ^ a b c "La rebelión Guajira de 1769 : algunas constantes de la Cultura Wayuu y razones de su pervivencia - banrepcultural.org". banrep.gov.co.